Good advice is worth its weight in gold, especially when you’re traveling. Getting first-hand advice can save you time, ensure you don’t miss an essential moment, and help you make good decisions on how to spend your hard-earned vacation dollars. 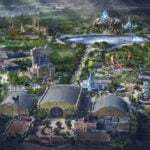 This is especially true for specialty locations like Disneyland Paris. 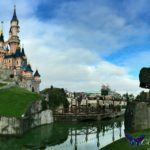 Disneyland Paris is celebrating its 25th Anniversary in 2017 (the park opened as Euro Disney on April 12th, 1992), making this the perfect year to enjoy the festivities. The anniversary theme – “It’s Time to Sparkle!” – introduces new spectaculars to make your visit even more memorable. You’ll want to be prepared, so you won’t miss a second of the magic. 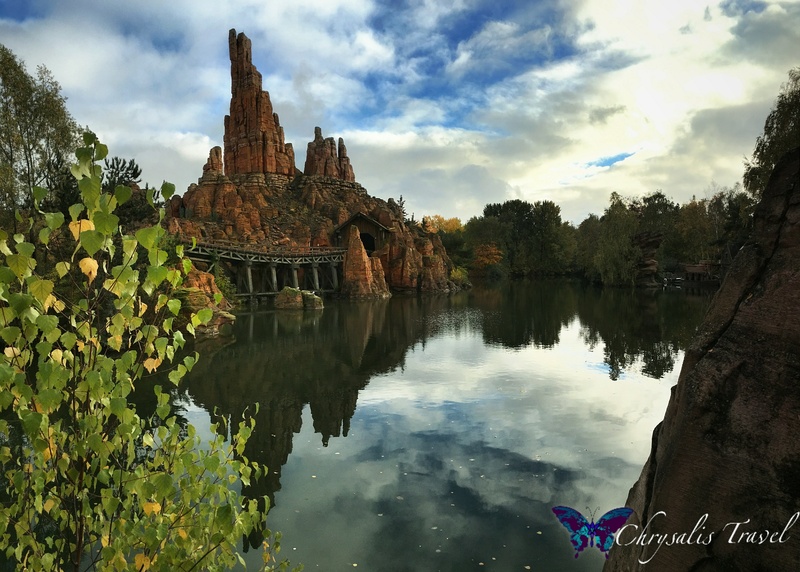 Here are my top 9 things you definitely won’t want to miss – gained from experience as a DLP Annual Passholder. Some are unique and found only at Disneyland Paris Resort. Some are delightful variations of classic Disney attractions. All are outstanding. 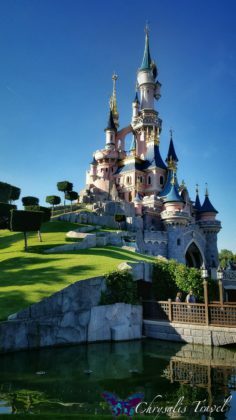 There are two parks at the Disneyland Paris Resort: Disneyland Park, and the Walt Disney Studios (now celebrating its 15th Anniversary). I divided this List into “family-friendly” and “wild side” features, with notations in which park they’re located. 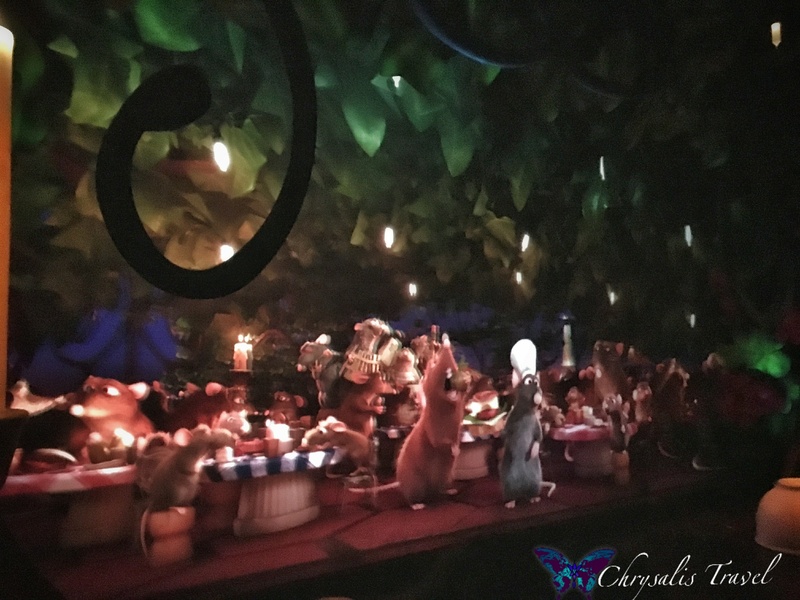 Ratatouille is perhaps the most famous of the attractions at DLP resort. It is an advanced-technology, GPS-driven attraction. 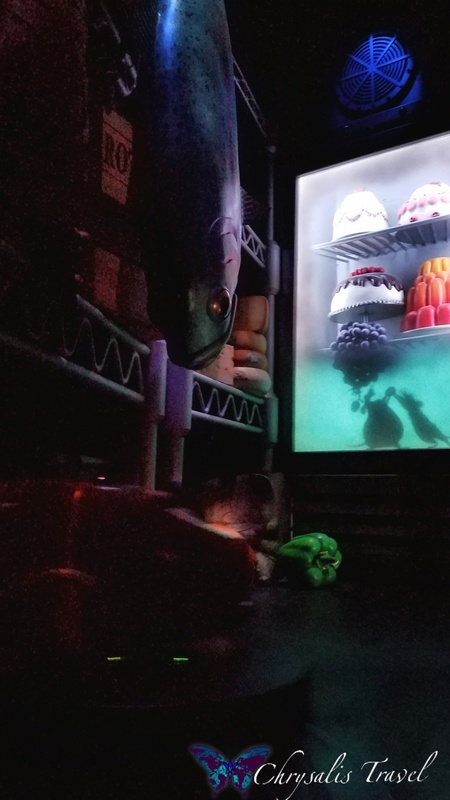 Follow Remy on adventures through the kitchen as your trackless ride vehicle (a rat) glides through the dark ride. 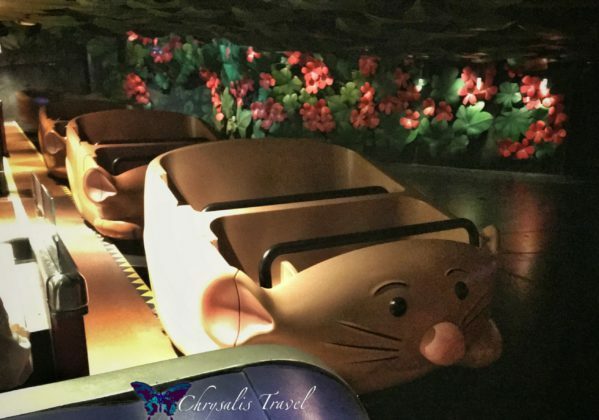 Ratatouille advances the GPS ride technology introduced with Tokyo Disneyland’s Pooh’s Hunny Hunt. 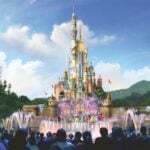 This attraction seamlessly blends 3D film with fluid ride-vehicle movements, and larger-than-life sets. Wander through an enormous refrigerator, dodge oven flames…and Chef Skinner. This adventure will please the entire family. Traveler’s tip: Because of the complicated ride systems, Ratatouille has been known to ‘go down’ with relative frequency. If you see the attraction is operational, don’t wait. Utilize FASTPASS and Single Rider queues when possible. All ages. Walk through attraction. 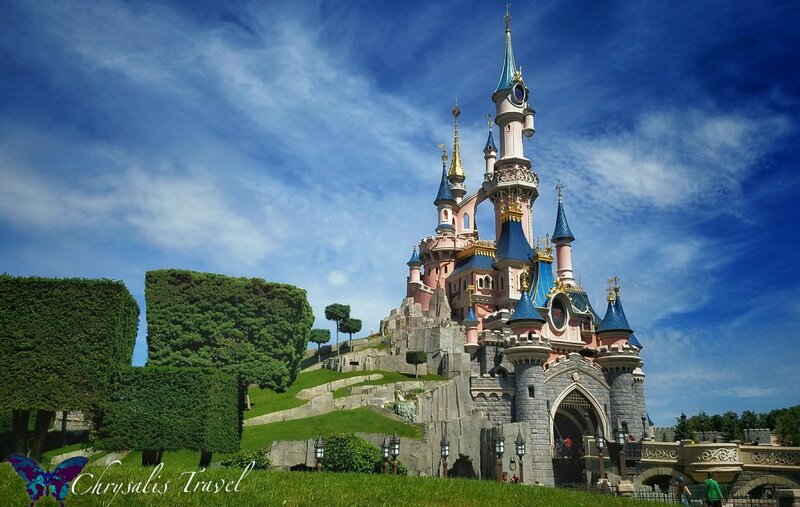 Disneyland Paris has – in my opinion – the most elegant of all the six Disney castles. 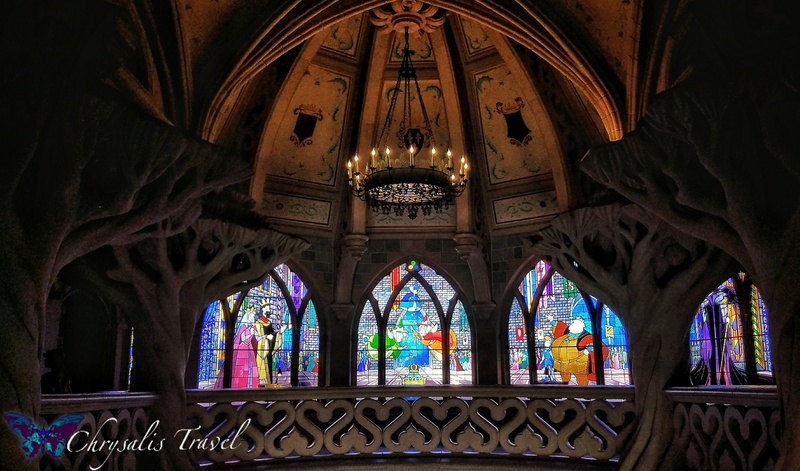 The castles in our domestic Disney parks were built in a German architectural style. Famously, Neuschwanstein castle in Bavaria was Walt’s original inspiration for the first Sleeping Beauty Castle. 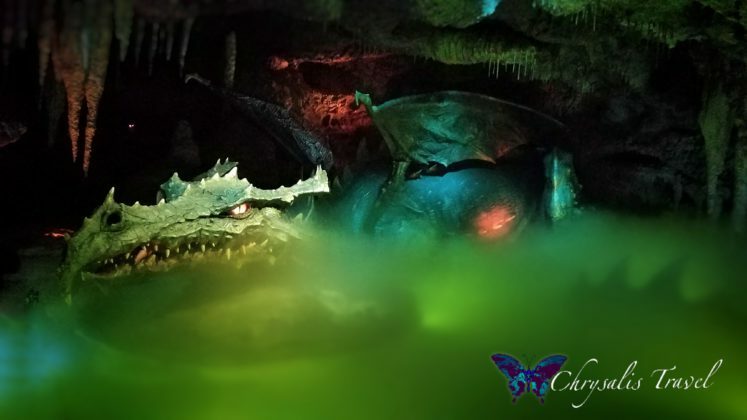 Traveler’s tip: Don’t forget to visit the Dragon underneath the castle. She awakens every few minutes and breathes out plumes of smoke. 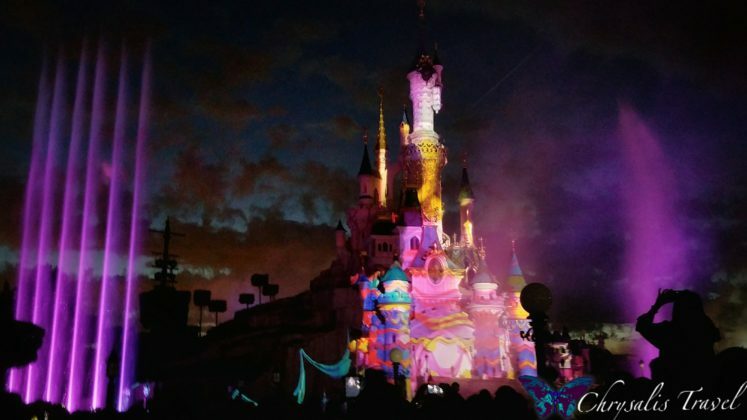 “Disney Dreams” was a gorgeous night time projection/fireworks show, designed to highlight the Sleeping Beauty castle (pictured here). 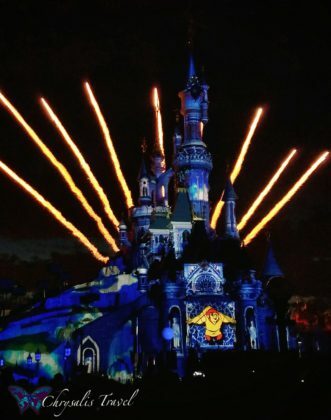 Now, the 25th Anniversary celebration features “Disney Illuminations,” which just debuted March 25, 2017. 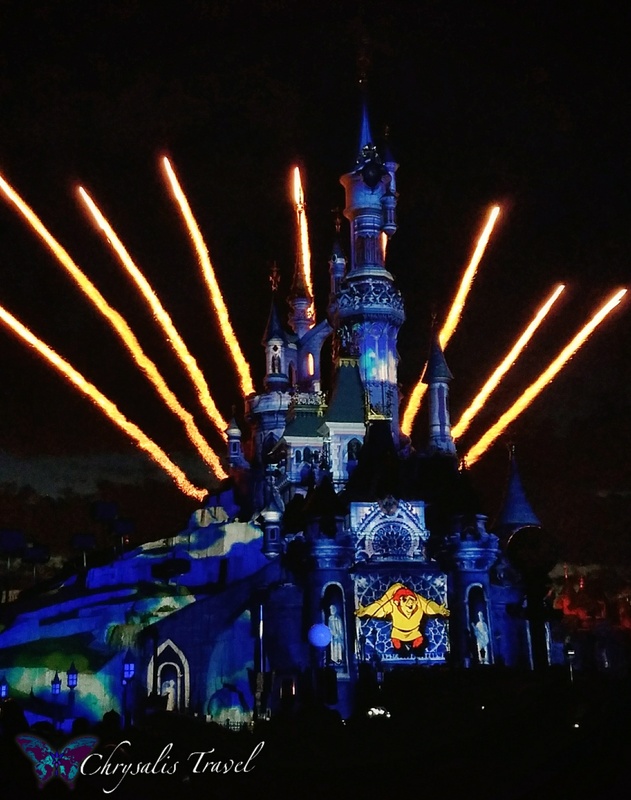 Keeping with the ‘sparkle’ theme, the show integrates precise projections, Bellagio-like fountains, fireworks, and lasers in a Disney-tastic way. 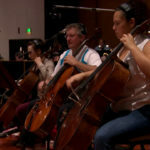 Sequences – in English and French – showcase characters from The Lion King, The Little Mermaid, Finding Nemo, Pirates, Beauty and the Beast (notably, the live action version), Star Wars, Frozen… and Mickey of course. Traveler’s tip: We enjoyed the view from just left of the hub (facing the castle). The fireworks line up right behind the castle from this vantage point for your photographs. Duration: 20 minutes. Arrive early to get a seat. 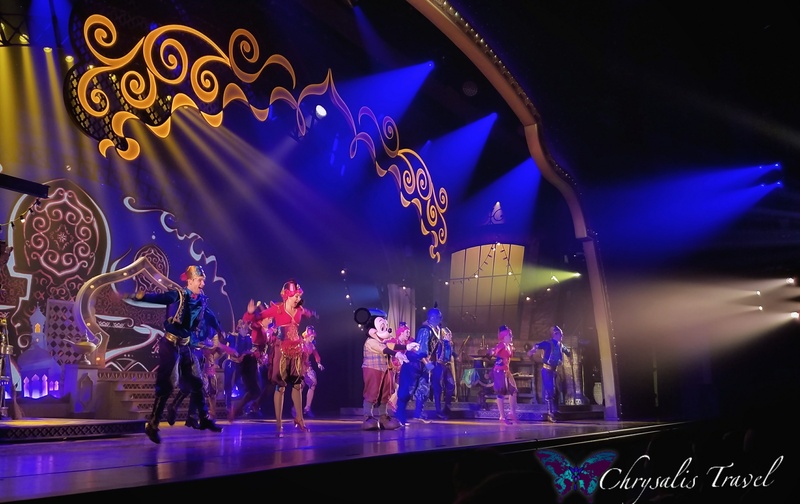 Mickey and the Magician opened in 2016 to rave reviews. It was so good, we saw it twice. Mickey, the Magician’s assistant, is given the tedious task of cleaning a dusty attic. Curiously, adventures find Mickey while the Magician is away, and characters enchantingly come to life. 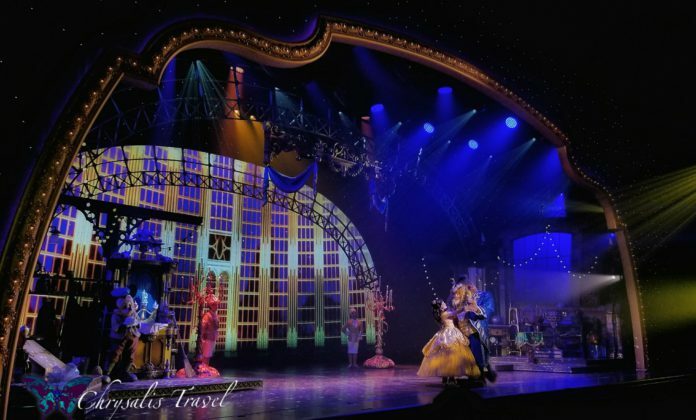 In grand Broadway fashion, Mickey meets up with Genie (from Aladdin), is encircled with animals from The Lion King, gets swept up in the ballroom scene with Beauty and the Beast, and visits with Cinderella too. Elsa’s on-stage transformation scene is especially impressive. Outstanding theatrical performances, lighting and set design make this show well worth your time. It’s also a great opportunity to rest tired feet and enjoy air conditioning. 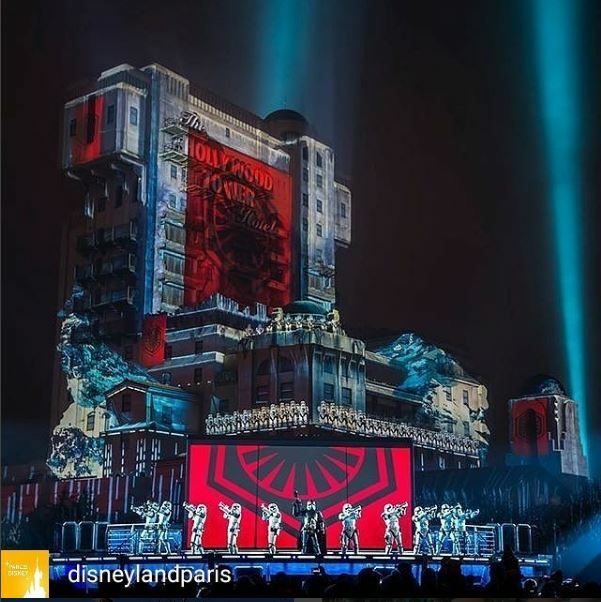 Paris’ Studios just unveiled Star Wars: A Galactic Celebration – a laser projection/fireworks show on a colossal scale. Picture Star Wars: A Galactic Spectacular at Disney World’s Hollywood Studios…and project that on the Tower of Terror. Add live villains on stage: Darth Maul, Captain Phasma, Kylo Ren, and First Order Stormtroopers. This is a must-see for any Star Wars fan and is definitely most impressive. Two words: fire-breathing dragon. 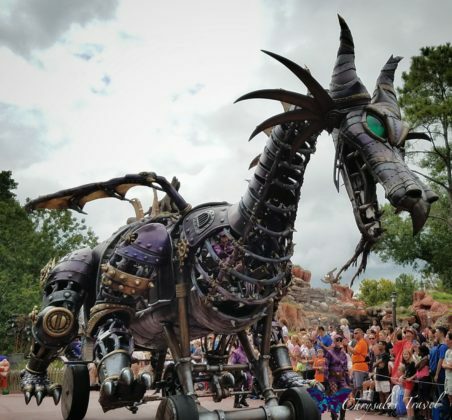 The 25th Anniversary parade showcases Maleficent dragon (resembling the one at WDW). 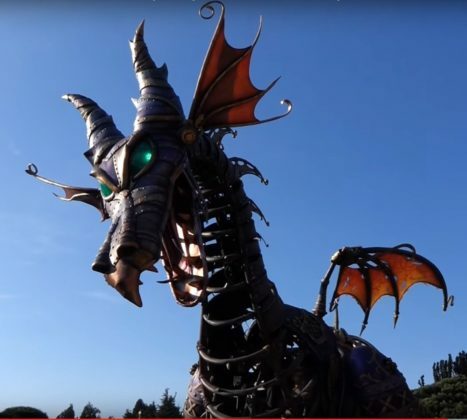 The promotional photo on the Disneyland Paris website is actually the dragon from WDW’s Festival of Fantasy parade, with Cinderella’s castle visible in the background. Here is a side-by-side comparison of the two dragons. Maleficent from WDW is on the left, with more of a thorns-and-armor design. Maleficent from DLP is more fleshed out in the wings and ears flaps, and decorated in more graceful motifs. Mickey and friends ride on a steampunk-inspired float to open the parade. Skull Rock features prominently on Captain Hook’s float. Crush and Squirt are totally bodacious on the Nemo float. Princesses galore join the celebration. Height restriction: 1.07 meters (42 inches), No FASTPASS. Single Rider service available. 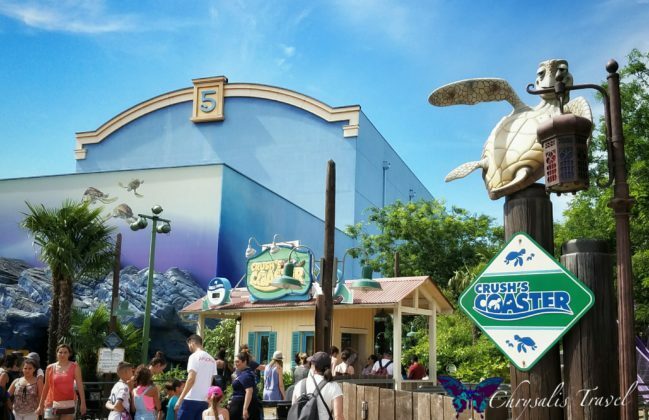 Crush’s Coaster is unique – found only at DLP. Take a whirl through the EAC (East Australian Current) with Crush on this creative coaster. Enjoy the sensation of floating with currents on a cross-ocean voyage. 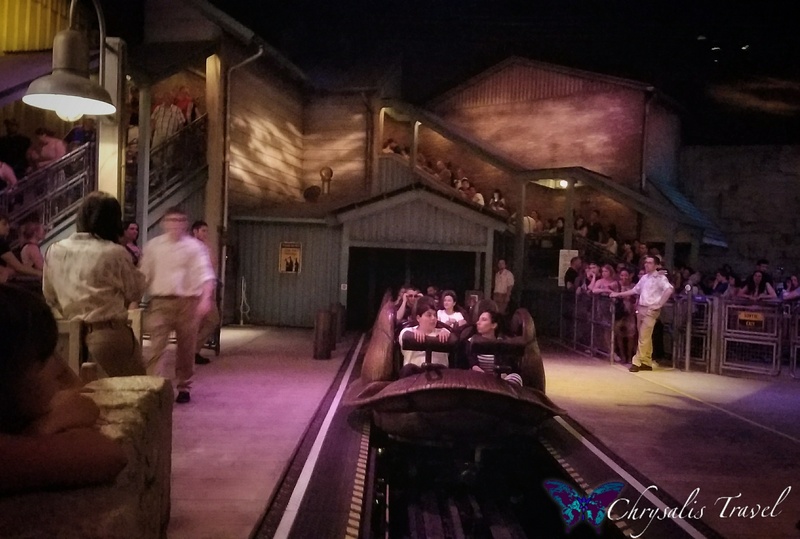 Ride through the dark in ‘turtle shells’ that spin independently of the track on this ‘totally awesome’ adventure… Dude! Traveler’s tip: the lap restraints and seat configuration on the ride vehicles are tight, even for average-sized Americans. If there is a seat tester, try it before you get in the queue, as this ride is very popular. 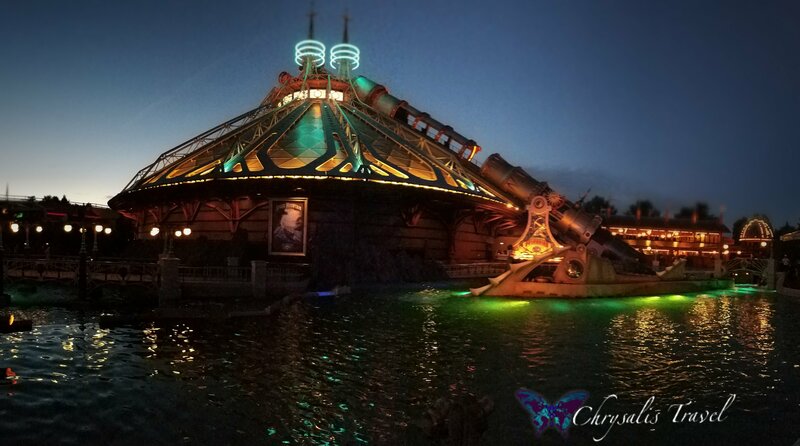 SM: Mission 2 is the only upside-down looping Space Mountain in all the Disney parks. Imagineered originally as Discovery Mountain, this attraction has gone through several theming changes over the years. Be prepared for the initial rocket blastoff (also unique to this Space Mountain), then a bumpy ride through the cosmos on the steel track. The unique styling of the exterior is a throwback to Jules Verne, and is very fashionable with the popularity of steampunk design. The newest overlay is the Star Wars-themed Hyperspace Mountain – to accompany the re-opening of Star Tours in 3D. Height restriction: 1.02 meters (40 inches), FASTPASS service available. No Single Rider. Big Thunder Mountain just reopened after a year-long renovation and is my favorite Big Thunder in all the Disney parks. Imagine plunging through pitch-black underwater tunnels for 10 seconds, only to emerge on an island in the middle of the lake. 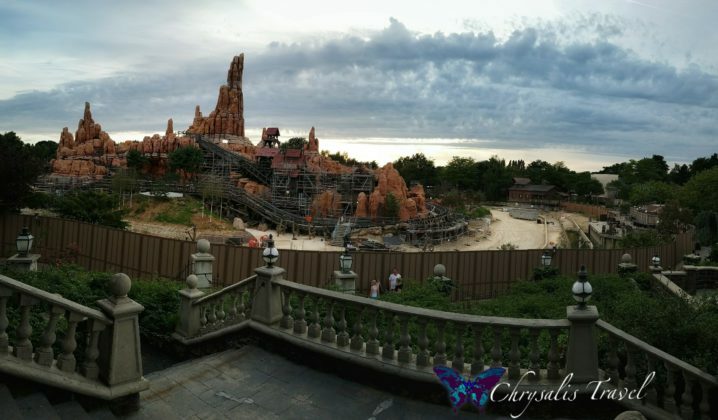 Big Thunder under construction with drained lake (left). Big Thunder reflections on the lake. Your train careens along the tracks to circle the island, giving you glimpses of amazing lake vistas, only to dive through the blackness again. The only way this could be improved: digitally upgrade the mine shaft explosion effects (similar to Disneyland Anaheim’s Big Thunder). Wish granted. 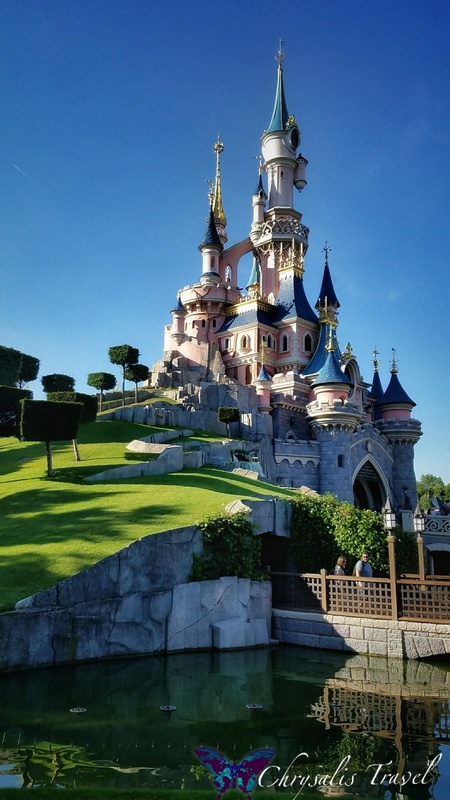 With all the sparkly 25th Anniversary celebrations ongoing at Disneyland Paris, there has never been a better time to plan a European Disney vacation. What are you most looking forward to seeing?